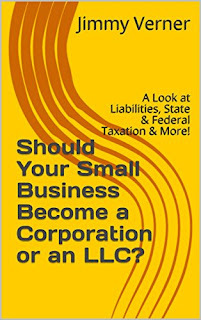 Should Your Small Business Become a Corporation or an LLC? : A Look at Liabilities, State & Federal Taxation & More! Starting a small business is challenging. You have to learn as much as you can about the business you want to open. You need to know how to make a pitch if you want investors. You must establish accounting procedures and become familiar with all the organizational and reporting requirements of state and federal governments. It can be quite the learning curve. One of the things you must decide is which business format you will choose. Should you run your business by yourself or with a partner? Should you become a corporation or a limited liability company? The survival of your business and even keeping your personal assets could depend on your answer. This brief ebook examines these questions from three perspectives. First, nobody wants to talk about what happens if things don’t work out because that is a downer and everyone is excited about the new business. But it is important to understand what liabilities you face if the business fails. And if the business succeeds, then the ongoing operation of your business can expose you to liability. Second, what are the income and sales tax consequences of setting up your business? Finally, should you consider becoming a nonprofit or a benefit corporation? We discuss these issues through the eyes of Anaya and Liam, two young entrepreneurs who want to start a business.